Made to offer power and speed without compromising on stability or control, the Rhino has been a hit ever since it was introduced in 2004. 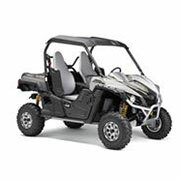 Whether you use this vehicle for work, play, or a mix of both, we have the best selection of Yamaha Rhino parts to help you experience this powerhouse at full capacity. When the Rhino came on the scene, it caused quite a stir for a few reasons. For starters, other side by side vehicles of the time were big, bulky, and slow. The Rhino was introduced as a more compact model with a penchant for speed and agility without losing any of the workforce friendly function or the stability needed to maintain safety. With a powerful engine coupled with an impressive throttle response by way of a high output DC-CDI ignition, this model was designed to offer a level of power lacking in other models on the market. Since then, the model has undergone a few changes to keep up with the times, but the hallmarks of the design still remain present even in the modern models. We are pleased to bring you everything this powerful vehicle needs to stay in top condition with our selection of Yamaha Rhino parts. Covering a wide range of years, our inventory of Yamaha Rhino parts gives you everything you could possibly need all in one convenient location. With a focus on quality and performance, the solutions we offer are OEM parts, so you get the right specifications for your model and series without worry. Not only do OEM solutions help narrow down the right fit, they also help to ensure the desired outcome intended by the manufacturer on matters of performance. Whether looking for front brake calipers, rear arms, a starter clutch, or a taillight, we have you covered with our selection of high-quality Yamaha Rhino parts. Find it all right here and buy with confidence with our OEM solutions!